for lunch (noon-2.30pm) and dinner (4.00pm-2.30pm). SHABU-SHABU can now be savoured with seafood at Shokudo, Armada Hotel in Petaling Jaya. Shabu-shabu is derived from the “swish swish” sound of cooking thinly-sliced meat in a pot. Healthy:Vegetables areadded last toabsorb the flavourful broth. From now till year-end, Shokudo is adding a twist to the healthy meal typically eaten with chicken meat and beef by giving add-on options such as squid, prawn, butterfish, tuna and salmon. Shokudo chef Syed Hilmi Hashim said the cold and rainy weather was perfect to have shabu-shabu as it helped to keep the body warm. “Most restaurants only serve it for dinner as it is said to be heaty but we are serving it for lunch as well. “It is also suitable for health-conscious people and those on a diet because 80% of the portion consists of fibre and protein, with no carbohydrate, salt or oil,” he said. 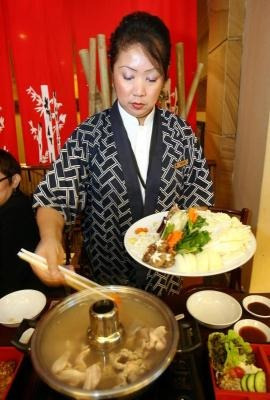 Hotel Armada public relations manager Myza Nordin said the shabu-shabu served comprised vegetables (Chinese cabbage, white radish, carrots, spinach and leeks), meat, tofu and udon noodles. “The proper method to enjoy shabu-shabu is to start of with the meat and seafood to enrich the broth followed by vegetables. The leftover broth is to be eaten last with noodles or rice. “These type of meals similar to the Chinese steamboat is best enjoyed alfresco,” she said. Shabu-shabu is priced at RM32++ for two servings, while the a la carte seafood top-up items are priced at RM9++ per portion. 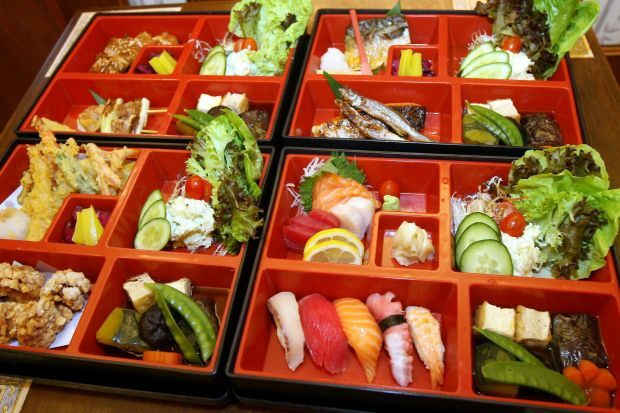 For this month, Shokudo will also be having a bento set meal promotion, serving two types of main dish per serving. There are four bento sets available: Tempura Bento (deep-fried prawn, pumpkin, carrot, eggplant and butterfish); Sushi Bento served with a combination of sushi and sashimi consisting of fresh salmon, tuna and butterfish; Chicken Teriyaki Bento (marinated chicken thigh served with sweet teriyaki sauce with two skewers of chicken and leek; and Bento Sakana (grilled pregnant fish, mackerel and salmon. Each bento set comes with a serving of chawanmushi, miso soup, salad, rice, assortment of fruits and free flow of green tea from RM32++ per set.